We get asked frequently about what housing should be used with ferrets so we decided to add a housing section to our website. 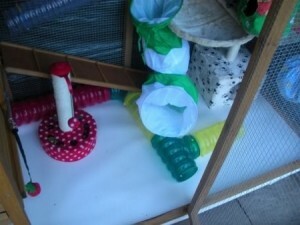 Ferrets can be kept indoors or outdoors. We keep them both indoors and outdoors so it is a preference really. There are some arguements that being kept outdoors is better for them due to the natural temperatures and amount of light and darkness. We have one group we keep indoors in a double story Ferret Nation cage which is our indoor cage favourite. When it comes to housing, bigger is better. If you have a garden, one of the best buys is a shed. 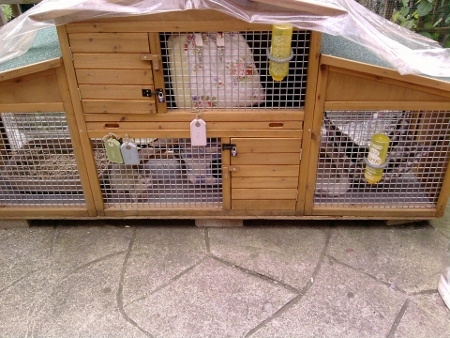 You can kit it out to your liking and it gives the ferrets lots of space to free roam safely. You can put hutches or cages inside the shed if desired which will keep them out of the elements. 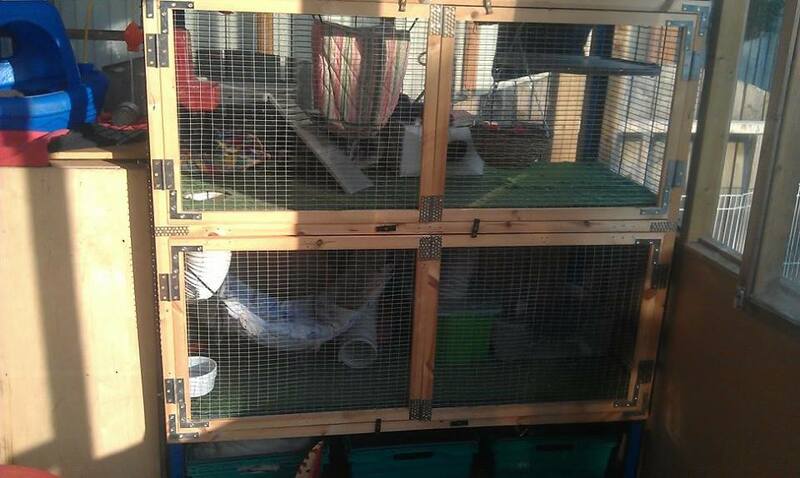 It is important that when housing your ferrets outdoors, they are sheltered away from the snow, rain, wind and sun. 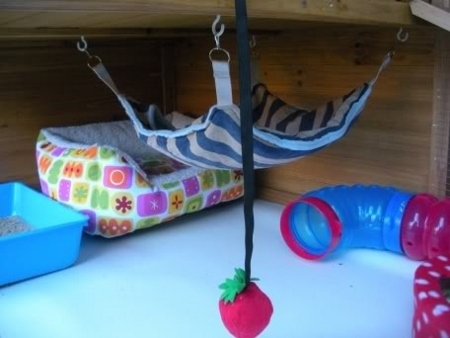 We use blankets, straw, hay, old t-shirts, cloth strips and shredded paper for bedding. We change the bedding atleast every two weeks. All our groups have hammocks in. Fresh water is given every day as well as food. Toys are washed regularly as well as the food bowls. 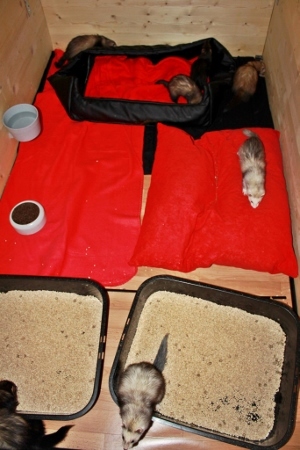 Our ferrets litter/potty corners are cleaned fully every single day. Sometimes more. 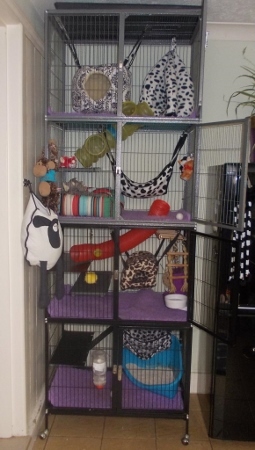 Keep in mind that this is how we do things and house our ferrets. Everyone has their own opinion on housing so when choosing, choose what is suited to the ferrets, you and your situation. Here is a picture of two of our sheds. The shed on the left is the nursery and is only used during the breeding season. It is kept empty during the winter months. 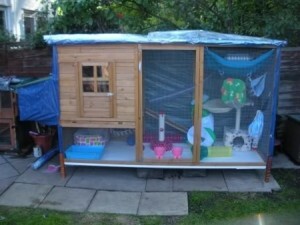 The shed on the right is the all around ferret shed where some are kept over the winter and summer. 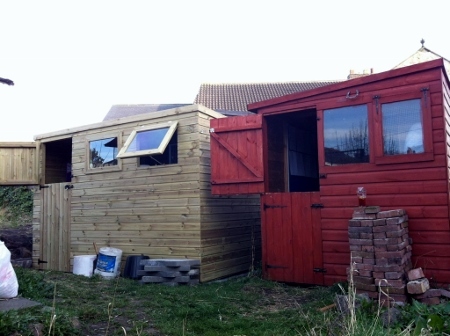 The brown shed is 10×8 and the red shed is 8×6. 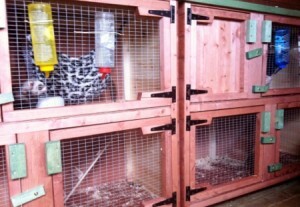 This is some of the hutches we had built for inside the all year around shed. Hammocks are a welcome accessory. And this is the inside of our nursery. 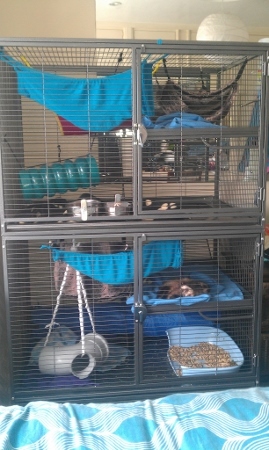 Things have changed a bit and we have removed the 4 tier and replaced it with four single tiers to move the more mobile kits into when they start to outgrow the original birthing hutch. And here is our indoor ferret cage. The set up gets changed every two weeks or so with fresh bedding and different toys. Here is one of our play sheds. Plenty of room and fun things to do! This custom built set up belongs to Gemma Dowson. 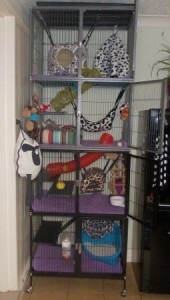 They converted a cage that was too small and expanded it and built on a whole new front. Wish we had that talent! 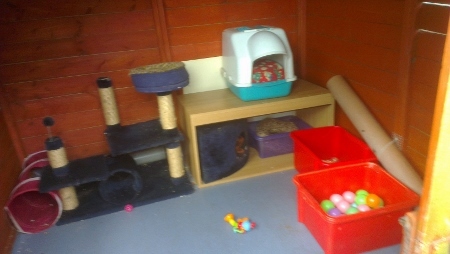 What a lush ferret pad! This set up is two Liberta Explorers stacked on top of each other and wired to make one huge cage that belongs to Joanna Monk. 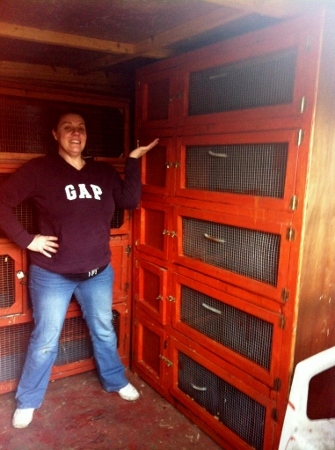 Her ferrets love it (We love it too!) and use every level. Now this set up is awesome. If only we had the space in our homes to do this. 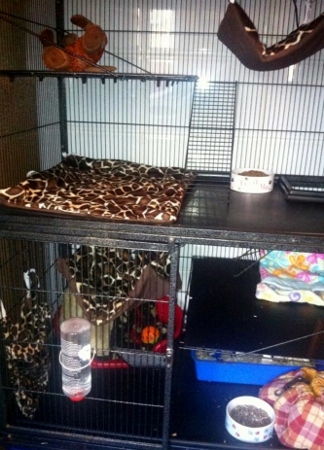 These three giant play pens belong to Tendzin Hellferret Sallberg. Here is a lovely outdoor set up from Rhiannon Jane Bell. She said this was in the summer so it doesn’t have the covers on that insulate it. 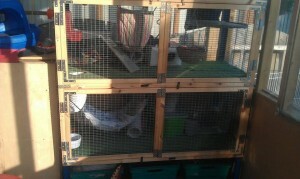 The chicken wire has been taken off and replaced with heavy duty galvanised wire. 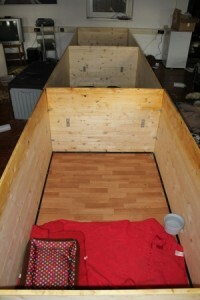 She also added a floor, inside there is vinyl flooring for easy cleaning. 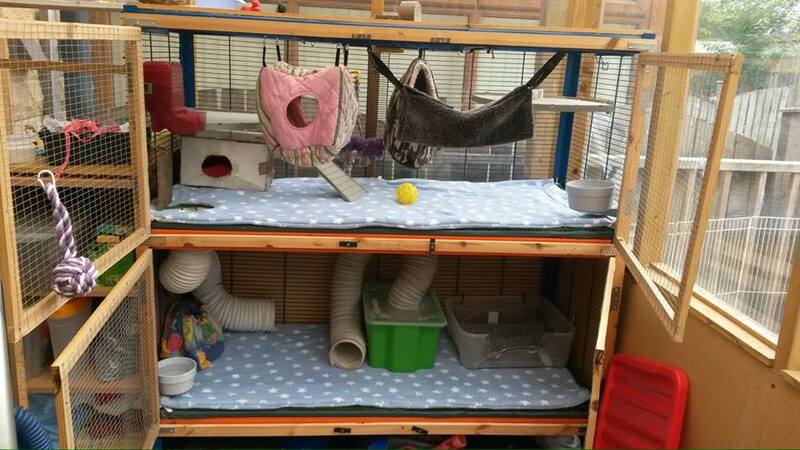 Here is a fab outside set up from Noush Thompson. It is a 9 foot coop they modified. They used tarpaulin to keep out the weather on a bad day. Added a floor and raised it up by adding legs. Decked out with loads of toys and hamocks. Looks like a ferrets paradise! We want to thank everyone for letting us share your photos. If anyone else would like us to post a photo on here to help people with housing ideas, please feel free to email them to us or post them on our Facebook wall.